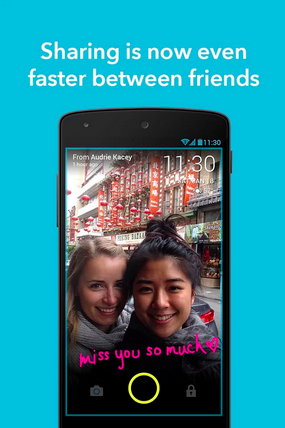 ScreenPop is an Android app that lets you share photo messages directly from your lock screen. If there are two things that smartphone users love, it’s instant gratification and pictures. ScreenPop combines the two by letting users send images directly from the lock screen, no pass PINs required. It’s a fun, quick-and-dirty way to share images/messages even faster than was ever possible before. Similar to Snapchat, the images sent via ScreenPop disappear when users unlock their phones. That means that users are prompted to send more photos than the founders originally expected, according to their comments in TechCrunch. It also means that the potential for embarrassing a friend with a silly pic is super high, as the images pop up automatically on a person’s phone and are visible to anyone who can see the screen. The parent company behind the new app is Locket, which launched as a “pay-for-swipe” service that put ads on Android lock screens. They moved away from that model, however, and now offer customized lock screens that highlight everything from news updates to cute pictures of kittens. ScreenPop was created with the same technology that earned Locket the Best App of 2014 award from Google Play. Building on Locket’s success, the same team launched ScreenPop, which already boasts some impressive numbers. The new app had 15,000 users singing on during beta and a recently closed $3.2 million round, a huge vote of confidence for the founders from investors like Tyra Banks and Turner Broadcasting. Taking one step out of the process of taking and sharing photo messages is really pretty brilliant. Now that Snapchat is showing indications that they’re ready to move on to a different kind of media experience, does ScreenPop have the potential to pull those disappearing photo-users on to their app instead? I know I, for one, will be staying tuned to find out.